Secretary-General António Guterres (at podium, right) and Moussa Faki Mahamat, Chairperson of the African Union Commission, address the press following the signing of a Joint UN-AU Framework for Enhancing Partnerships on Peace and Security in 2017 (File). United Nations Secretary-General António Guterres and the Chairperson of the African Union, Moussa Faki Mahamat, today signed a new landmark framework to strengthen partnership between the two organizations on peace and security pillars and better respond to the changing dimensions and evolving challenges of peace operations. 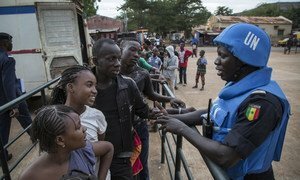 “We no longer have the traditional peacekeeping operations, where peacekeepers separate two countries or two groups within the same country that have signed an agreement, and a makeshift peace essentially prevails,” Mr. Guterres told the press at a stakeout, alongside Mr. Mahamat, after signing the framework at UN Headquarters in New York. “We are witnessing, in Africa, as around the world, changes […] that force us to have a strategic review of the way peace operations take place,” he explained. The Joint UN-AU Framework for Enhancing Partnership on Peace and Security is expected to boost the coordination between the two organizations at all levels. It is also anticipated to strengthen cooperation on issues ranging from human rights and good governance, to sustainable and inclusive development. The new understanding will also help align the African Union’s Agenda 2063 with the global 2030 Agenda for Sustainable Development to ensure that they are both a “success story” in the continent. Prior to the stakeout, Mr. Guterres and Mr. Mahamat jointly led the first Joint UN-AU Annual Conference where they discussed the complementarity between the 2030 Agenda and the AU’s Agenda 2063, as well as the fight against terrorism and the financing of operations led by the AU. They also discussed situations in several countries, including Libya, Mali, the Central African Republic, and Somalia, and discussed efforts to combat the activities of the Boko Haram terrorist group. United Nations peacekeepers face a raft of challenges – terrorism, hostile host governments, floods of illicit weapons, and sometimes being deployed to places where peace itself is at stake – Secretary-General António Guterres said today, underscoring that all parts of the UN have a role to play in making sure 'blue helmets' can deliver on the mandates assigned to them.